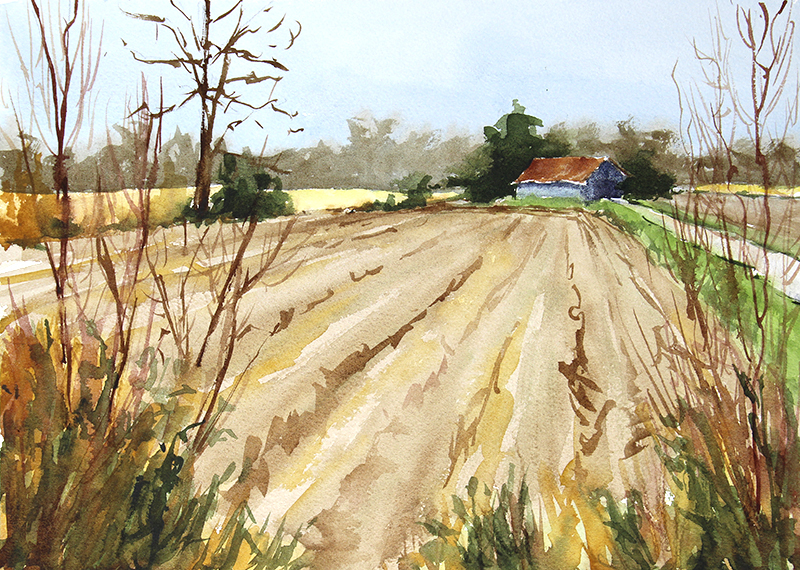 © Robin Edmundson, 'Winter Cornfield, Blue Barn', watercolor, 10 x 14 inches. They're varied. This has a negative flipside when it comes to things like beekeeping, but mostly it makes things really interesting. Willow tips turn gorgeous reds in the winter and get brighter as the weather warms in the spring. Cornfields retain a lot of gold all winter long and can really glow when the light is right. Last year's little blue stem and wild petunia plants turn the most gorgeous orange. You can see it in all the hayfields, roadside ditches and windbreaks. The old gray tobacco barns turn blue - it's probably because the old rusty roofs really show their orange this time of year. Oaks and young beeches hang onto their leaves most of the winter. Beautiful russets, rich browns all season long. Right now I'm loving the quieter palette of a southern Indiana winter. Best compliment ever! I'm so glad!